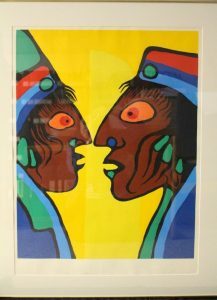 Discipline, a colourful serigraph, depicts two larger than life faces in profile nose to nose, almost touching each other in an intense confrontation. Shaman Motifs Mohawk Clan (1975), an original acrylic painting, reveals a unique figure from the waist up filling the entire canvas. He is an intense, bright, and engaging presence. Norval Morrisseau can be described as one of the most recognisable painters in Canada. Morrisseau is Anishinaabe, and was born on the Sandy Point Ojibway reserve. He was the influential founder of the Woodland School of painting. 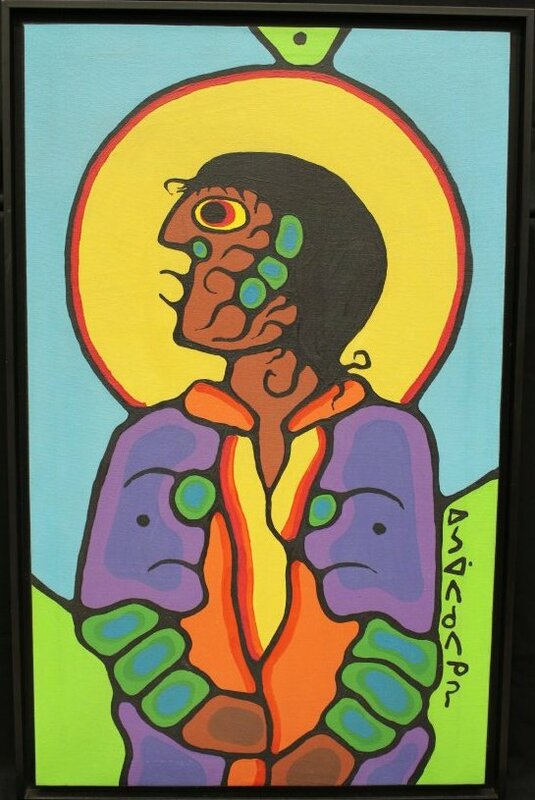 The Woodland School courageously and controversially presented traditional Anishinaabe icons and legends through the Western media of easel painting and printmaking. Morrisseau painted for more than 50 years, and inspired many to give a visual voice to their cultural images and stories. Morrisseau learned the icons and images associated with his grandfather’s knowledge. His grandfather, Moses Potan Nanakonagos, was an Ojibwa shaman who taught him the teachings of the Midewiwin. Oral tradition is a key part of the passing of this knowledge, but Morrisseau became the first Eastern Woodland artist who depicted and presented his culture through art in painting and printmaking. His artwork drew from several influences during the course of his life and reflected his self-development, culture, and spiritual beliefs. His influences include: Indigenous cultures and tensions with Christianity; Anishinaabe decorative arts; Shamanism; Midewiwin scrolls; rock paintings; Spirituality; The duality of the Soul and Body; Family; and the relationship between all living things. Morrisseau produced acrylic and oil paintings, prints, and drawings. His artworks are found in numerous institutions and collections across Canada such as The National Gallery of Canada, in Ottawa, Ontario. His artwork combines intense colours, flowing lines and semi-abstract figures, which can be seen in the two works donated to MOA. He passed away in December 2007. As mentioned earlier, Discipline is a serigraph, which means that Morrisseau screen-printed it in layers on paper. The bold yellow background would have been printed first, and then the colourful layers of the figures were printed on top. This work is from an edition of 93 prints, which gives a sense of the laborious working process, as well as the unique quality of print-making for distribution. The graphic images created by flat fields of colour is a quality of the print-making process, but is also part of Morrisseau’s own creative way of seeing the world. The graphic quality of colour defined by shapes, often organic, is also felt in Shaman Motifs Mohawk Clan (1975). This acrylic painting’s bold and commanding figure is created by building bright colours between black outlines. Morrisseau signed his work with Cree syllabics on Shaman Motifs Mohawk Clan, in the pen name for the Anishnaabe name he has been honoured with – Copper Thunderbird. Morrisseau is an important and influential Anishinaabe painter who has made vibrant pieces about his cultural viewpoint and stories, and they remain filled with life and vitality today. CBC Arts. “Iconic Canadian painter Norval Morrisseau dies at 75” CBC News, December 5, 2007. Accessed November 25, 2016. http://www.cbc.ca/news/entertainment/iconic-canadian-painter-norval-morrisseau-dies-at-75-1.648773. Norval Morrisseau Entry. “Biography,” Wikipedia. 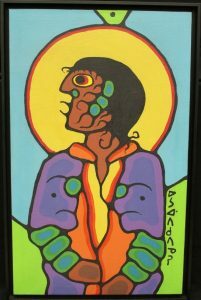 Accessed November 25, 2016. https://en.wikipedia.org/wiki/Norval_Morrisseau. “Teachers Resource Guide,” MacKenzie Art Gallery, p. 15-16, 2013, accessed July 26, 2016, http://www.mackenzieartgallery.ca/admin/aMediaBackend/original?slug=7-pniai-teacher-resource-guide&format=pdf.